Dolmuş minibuses at Selçuk Otogar (bus station). See What is a dolmuş? below. has its own travel guide and photo gallery. be found with the photos in our three photo galleries. We have tried to find as much accurate, up-to-date information about travelling to Selçuk as possible. and sources do not always agree on details. It always pays to double-check information. to ask at bus and train stations or local travel agents. 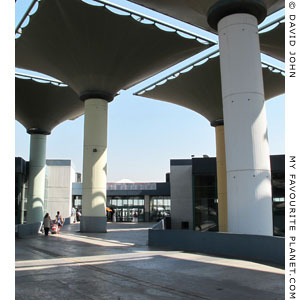 The nearest airport to Selçuk and Ephesus is Izmir Adnan Menderes International Airport (Havalimanı), which has its own train and metro station. 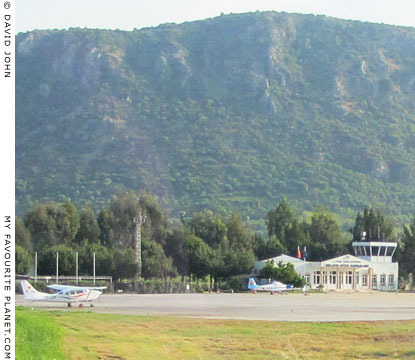 The airport is 18 km south of Izmir, and only 65 km north of Selçuk. If you travel by train (see below) you do not have to go into the city centre to get here. By bus it is a bit trickier (see below). for international and domestic flights. 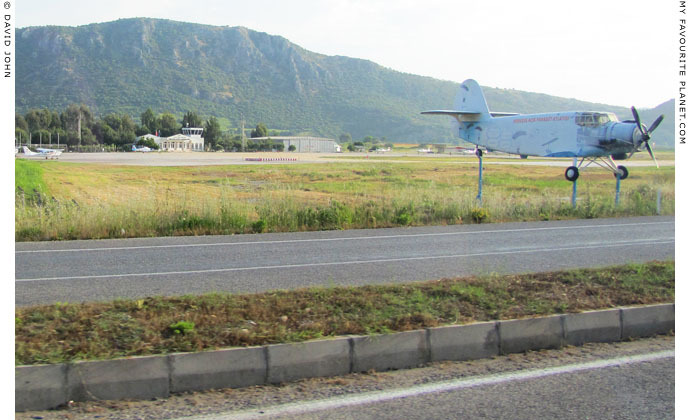 The tiny Selçuk-Efes Airport (Turkish: Selçuk-Efes Havaalanı), just outside Selçuk, is used only by private, firefighting and crop-spraying aircraft. It is often used by visiting millionares, politicians, dignitaries and other VIPs. It also provides training and facilities for flying private and commercial aircraft and microlights, as well as for skydiving and parachuting. Many hotels in and around Selçuk (e.g. in Kuşadası) offer free bus transfers to and from Izmir airport. Check for transfer costs and details when booking your hotel. marks the location and serves as an advertisment for the local parachuting club. Daily ferries cross the short distance between the Greek island of Samos and Kuşadası. See How to get to Kuşadası for further details. from Kuşadası half-hourly dolmuş minibuses travel to Selçuk and Ephesus (see below). It is possible to visit Ephesus from Samos (or vice versa) in one day, and organized excursions are available. However, you may find it less strenuous and more enjoyable to stay at least one night in Selçuk or Kuşadası. There also ferries between the Greek island of Chios and the Turkish resort of Çeşme, around 1.5 hours by road northwest of Selçuk. We have not yet been able to confirm information about a direct route by public transport between the two towns. There are regular buses from Çeşme to Izmir (1.5 hours in the opposite direction! ), from where there are regular trains and buses to Selçuk. See details of buses to/from Çeşme below. For independent travellers, we recommend that you buy a good up-to-date road map in your home country. Accurate maps in foreign languages are not easy to find in Turkey. 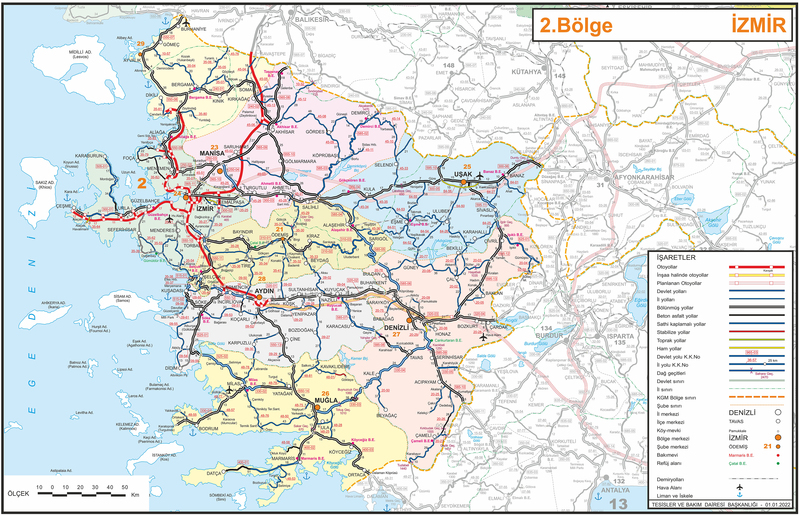 The Website of the Turkish General Directorate of Highways www.kgm.gov.tr (in Turkish and English) publishes downloadable detailed road maps. 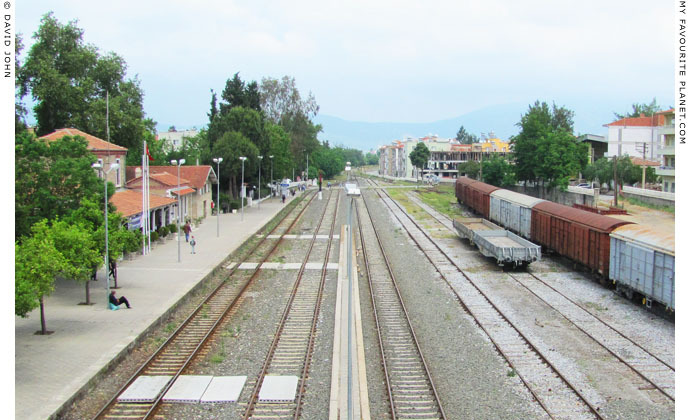 Selçuk railway station is in the town centre, about 10 minutes walk from the bus station (otogar). Trains from Izmir's conveniently central Basmane station (Basmane Gar), stopping also at Izmir Airport, to Selçuk, Söke and Denizli (for Pamukkale), are fast and cheap, but not as frequent as buses. The advantage over buses is that you do not have to get to the Izmir bus station which is 8 km from the city centre (see below). From Denizli station you can take a dolmuş (minibus) or taxi to Pamukkale. Distance 20 km. Journey time 20-30 minutes. Turkish State Railways website, in Turkish and English. 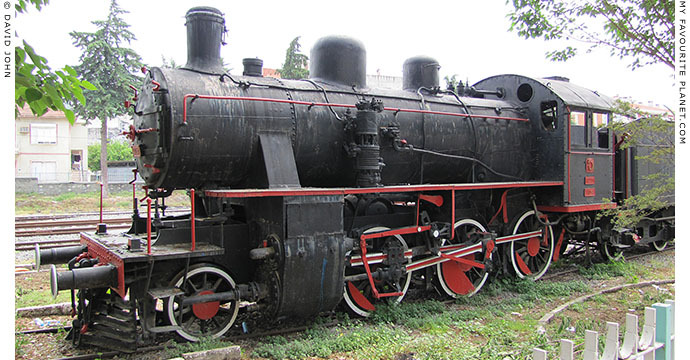 Information about train travel within Turkey. Run by Jean-Patrick Charrey in Paris, France. 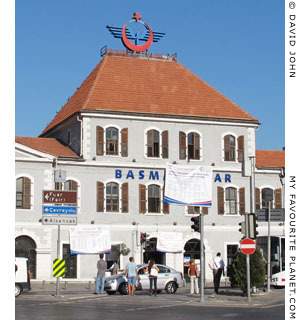 Basmane railway station in the centre of Izmir. Fast, cheap, comfortable and frequent buses connect Selçuk with long-distance destinations such as Izmir, Bodrum and Pamukkale (see below). For long distance buses it is advisable to book in advance. Your hotel will usually phone a booking for you, free of charge (in some cases they earn a small commission from the bus company). Buses are less frequent in winter than in summer. The Selçuk central bus station (Otogar), for local (Ephesus, Kuşadası, Şirince, Aydin) and long distance destinations, is in the town centre, near the town hall and Ephesus Museum, and 10 minutes walk from the railway station. There are toilets (1 TL) and a café at the otogar, and grocery shops nearby. There is a dolmuş (minibus) every half hour between the Selçuk otogar (central bus station) and the lower entrance of Ephesus archaeological site. 3 km, journey time 5-10 minutes. Dolmuşes between Selçuk and Kuşadası also stop near the lower entrance of Ephesus. Dolmuşes run between Selçuk and the seaside resort of Kuşadası (18 km southwest) every half hour. Journey time around 30 minutes. Along this route, the bus stop for the lower entrance to the Ephesus archaeological site is on the main road, 3 km (5-10 minutes) outside Selçuk. Be sure to tell the driver if you want to get off at Ephesus. From the bus stop, it is a pleasant 10 minute walk along a minor country road (signposted) to the site entrance. Taxi drivers often tout for business at the bus stop. Dolmuşes run between Selçuk and the quaint (touristy) old hill village Şirince (8 km) about every 30 minutes. To reach Davutla and Güzelçamlı you can take a dolmuş to Kuşadası (see above) and change to another dolmuş there. There are dolmuşes every 20-30 minutes between Kuşadası Davutla (15 km) and Güzelçamlı (23 km), major beach resorts south of Kuşadası with acres of self-catering apartments. The route is south along the coastal highway, with stops at the beach hotels along the way. The village of Güzelçamlı is the furthest from Kuşadası, journey time around 30 minutes. From here you can visit the meagre remains of ancient Panonion on the side of Samsun Daği (Mount Mykale), the seaside Cave of Zeus (Zeus Mağarası, 2 km south) and the Dilek Peninsula - Büyük Menderes Delta National Park (Dilek Yarımadası Milli Parkı, known locally as Milli Parkı). See Ionian spring part 1 at The Cheshire Cat Blog. There are buses to and from Izmir bus station (Büyük Otogar, large bus station; also known as Yeni Otogar, new bus station) every 30 minutes. The journey time is around 1.5 hours. A single ticket costs 10 TL. Tickets can be purchased at kiosks near the bus bays. At Izmir buses for Kuşadası arrive and leave from the upper level of the enormous, chaotic bus station which is 8 km to the east of the city centre. This means that if you are arriving fron Izmir Airport you have to travel for at least an hour in the wrong direction to catch a bus to Selçuk. We have heard that buses between Izmir and Selçuk stop at Izmir Airport on the way, but have been unable to confirm this. It may seem logical and reasonable, but things do not always work out that way. Consider taking a train (see above). Bus tickets can also be purchased from the various travel agencies opposite Izmir's central Basmane railway station (Basmane Gar). Some of the travel agencies offer free dolmuş transfers to the bus station. To/from the city centre, bus 54 to Konak and bus 191 to Yurtoğlu. Both stop near Basmane railway station. (Ask the driver to let you off at Basmane, if that is where you want to go.) Journey time 20-30 minutes, depending on traffic. Fare 2 Lira. To Izmir Airport (see above) take bus 204. Journey time 60 minutes, depending on traffic. Fare 4 Lira. The route/timetable finder is difficult to use as you have to enter the name of the departure and destination points; not easy if you do not know Izmir. Havaş is a private company which runs comfortable coaches at reasonable prices to and from airports around Turkey. Havaş Shuttle buses run between Izmir airport and the centre of Izmir, stopping at Basmane and the Efes Hotel (Efes Oteli), every half hour (03:30 - 23:30). Journey time 60 minutes. Fare 10 Turkish Lira. Excellent service. Although Izmir's public transport system is good and cheap, if you are travel-weary, in a hurry or carrying luggage you may prefer to take a taxi. Between the otogar and the city centre a taxi costs around 30 Lira. Be sure to ask the driver for the price (in Turkish Lira!) before you get in the taxi! and a fixed rate of 2.25 TL per kilometre. At Selçuk Otogar (bus station) I was told that there were no buses to the House of the Virgin Mary (Meryemana, see Ephesus page 4: Sightseeing) and that the only way to get there was by taxi. 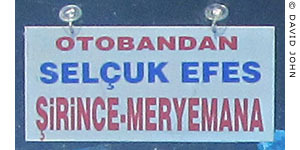 However, later I noticed a dolmuş parked at the edge of the bus station which displayed a destination board for Şirince and Meryemena (see photos). What's going on here, then? Dolmuş (minibus, pronounced dolmush) services provide transport around Selçuk, to Ephesus, Kuşadası, Şirince, Aydin and other local villages and beach resorts. 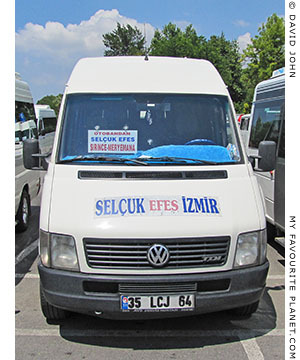 A dolmuş is a type of local private minibus found all over Turkey. Sometimes the fare is fixed, sometimes they operate a bit like taxi in that you share the fare with other passengers. Often there is no fixed route or timetable: the dolmus leaves when it is full, or the driver decides he has enough passengers, and he may go off the main road to take a passenger to a particular village or house. Tickets or receipts are usually not issued. Dolmuşes can get cramped and very full, and the reinforced suspension often provides a bumpy ride, especially on country roads. However, they are cheap and reliable, and mostly the friendliest way to travel around the country. The dolmuş services within Selçuk district and to local destinations are now regulated, with fixed fares displayed on a list in the bus, although timetables are still approximate. All the dolmuşes in the area are white and have the names of their start and destination places painted on the front. Outside towns and villages there are fixed stopping points, although not always recognizable bus stops. Usually, you can flag down a dolmuş from anywhere along the roadside and drivers will stop for you, provided they are not full. centre and even further from the airport. It is not connected to the metro or railway. To reach the archaeological sites of Priene (40 km), Miletus (62 km) and Didyma (81 km), as well as as other destinations south of Selçuk, such as the beach resort of Altinkum (85 km), you must travel by dolmuş to the town of Söke (around 1 hour south) and change there. The route follows the coastal highway south of Selçuk and Kuşadası, stopping at the many beach hotels along the way, then heads inland at the major junction a few kilometres north of Güzelçamlı. A special tour bus to Priene-Miletus-Didyma-Altınkum leaves Selçuk Otogar at 9 am every morning in summer. After a stop at each of the archaeological sites and a beach stop at Altınkum, the bus to Selçuk by 5 pm. Miletus (62 km) is the most difficult site to reach from Selçuk or Kuşadası as it is on the old road south of Söke to Akköy, 5 km south of Miletus. Most dolmuşes now travel on the new highway. There aren't even any taxis in Akköy. There are a few dolmuşes a day between Söke and Akköy along the old road, passing Miletus. I know, I have travelled on them. But schedules are impossible to find - even on location. You can ask at your hotel, a local travel agent or at Söke Otogar. The alternative is to take a dolmuş to Akköy and walk or try to find a lift the 5 km north to the site. You could also take a taxi from Söke, Priene or Didyma. We have heard that the Ege Koop bus company operate a direct bus service from Çeşme to Selçuk and Kuşadası, but have been unable to confirm this. It appears the company does not have a website, but from other sources it seems there are two buses a day, leaving Çeşme at 10:00 and 17:00. Journey time around 1 hour 30 minutes. According to the Selçuk bus station website, the Ege Koop bus company run services between Çeşme, Selçuk, Kuşadası, Bodrum, İstanbul and Ankara. If you have any further information about this service, please get in contact. The other alternative, if you want to travel by bus from Çeşme (ferries from the Greek island of Chios) to Selçuk or Kuşadası, is via Izmir, 1.5 hours in the opposite direction! journey time 1 hour 35 minutes, fare 25 TL. Some buses between Çeşme and Izmir terminate at the Izmir's main bus station (Büyük Otogar, see above), but many leave and arrive at the smaller Uçkuyular Bus Terminal in a southwestern suburb of Izmir, which means spending another hour getting to the main bus station or railway station by taxi or local bus. The Izmir metro is currently being extended and will soon have a station near the Uçkuyular Bus Terminal, with direct connections to the city centre and Basmane Railway Station in one direction, and to the airport in the other. The bus to Istanbul, operated by the Kamil Koc bus company, runs once a day. Journey time 11 hours. Fare around 80 TL (38.00 Euro). Departs from Kuşadası / Selçuk 21:30. QUICKER: The bus to Bandirma, from where there is a fast ferry to Istanbul. We hope to post more details about this service soon. There are 3 - 6 buses every day between Selçuk Otogar and Denizli/Pamukkale Town (approx. 200 km), although the trains (see above) are faster and more comfortable. and costs around 35 TL. The buses are operated by Pamukkale Turizm. It also quotes a single ticket price of 22 TL. Denizli Otogar (Bus Terminal) which is 20 km from Pamukkale. From Denizli Otogar you can take a dolmuş shuttle or a taxi to Pamukkale. Buses between Çeşme and Bodrum, also operated by the Pamukkale Turizm bus company, stop in Selçuk and Kuşadası otogars. Journey time from Selçuk to Bodrum (150 km) is around 3 hours. The fare is around 30 TL. From Selçuk to Çeşme (155 km) takes around 2.5 hours. The Pamukkale Turizm website www.pamukkale.com.tr is in Turkish only. 07:30, 08:30, 16:30, 19:00, 20:30. This is all a bit confusing, as Selçuk is 30 minutes north of Kuşadası. Presumably, the bus stops at Selçuk first, continues to Kuşadası and then to Söke. and from the town of Söke (1 hour south of Selçuk). Taxis can be an economical and convenient way to travel to places not covered by frequent bus services, particularly for groups of 2-4 people. Many taxi drivers in Izmir, Selçuk and Kuşadası speak either English or German (or both) and even French, and can provide a lot of information about their locality. The best are also entertaining. In Selçuk taxis can be found easily in front of the railway station and at the bus station (otogar), and at both upper and lower entrances ot the Ephesus archaeological site. Ask the taxi driver the price to your destination before accepting his services, and make sure of the price in Turkish Lira, even if you are paying in another currency. Watch out for this, especially in Izmir: a driver may demand, say 30 Euro (= 60 Lira), rather than 30 Lira at the end of the journey! For long distance rides, ask if there are any extra charges, for example road tolls. Luggage does not cost extra. Tips are always appreciated (10 - 15 %) but not obligatory. Special prices can be negotiated with taxi drivers for day-trips and visits to local places of interest, such as Ephesus, the Cave of the Seven Sleepers, the House of the Virgin Mary (Meryemana) and the village of Şirince. Deals usually include waiting times at sites and lunch breaks at local restaurants. 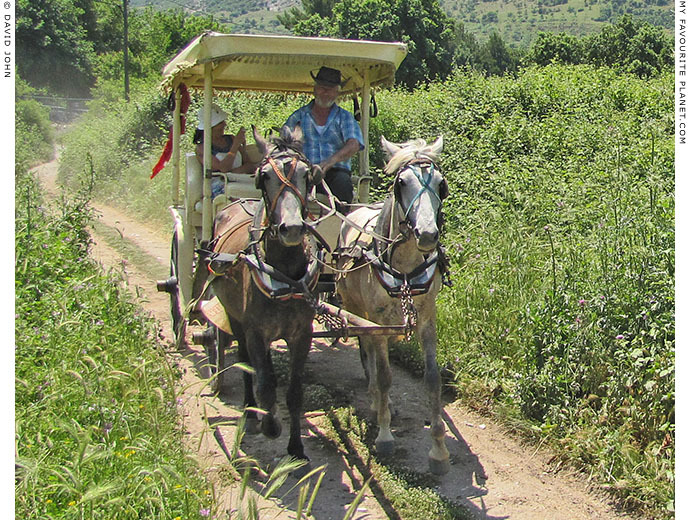 The open horse-drawn carriages which whisk tourists around Ephesus are known here as faytons, after Phaeton (or Phaethon, Φαέθων, the Shining One), son of the sun god Helios (or son of Apollo), who nearly set the world in flames when he lost control of his father's chariot of the sun. Zeus prevented the disaster by stopping the chariot with one of his thunderbolts which also killed Phaeton. The moral of the story: never borrow your dad's chariot. The name phaeton was given to sporty horse-drawn carriages in the early 19th century. Fayton drivers tout for business at several key places around Selçuk and Ephesus, and will offer visitors a tour around the Ephesus countryside, including a visit to the nearby Cave of the Seven Sleepers, located along a small farm road between the two entrances. Tour options also include the Meryemana (House of the Virgin Mary, entrance 15 Turkish Lira, around 7 Euros), on a wooded hill 5 km south of Ephesus (see Ionian spring part 1 at The Cheshire Cat Blog). At time of writing (May 2013), a ride between the upper and lower entrances costs 40 Turkish Lira, and between Ephesus and Selçuk 30 Turkish Lira. The faytons seat four passengers. in Ionian spring part 3 at The Cheshire Cat Blog. and the upper entrance of the Ephesus Archaeological Site (3 km). See Ephesus page 4: Sightseeing for further details. steeper as you climb up to the House of the Virgin Mary. Cycling around the beautiful coastal areas, inland countryside and villages of Ionia is a joy, particularly once you get off the main roads. The topography is varied, with flat river plains and some steep hills. The area around Selçuk and Ephesus is flattish, with hills rising steeply to the north, south and inland (east). There are some good climbs, for example up to the House of the Virgin Mary (Meryemana), to Kusadasi and from the coast up to Söke. South of Söke, towards Priene, Miletus, Didyma and Altinkum there is a good, flattish minor road along the marshy delta of the Büyük Menderes river (Maeander) with little traffic. Naturally, it can get strenuous in high summer when temperatures rise to 40 degrees Celcius. A good sun-blocker and plenty of water are strongly advised. Parking and leaving bicycles is generally safe in the country and villages, but risky in towns. 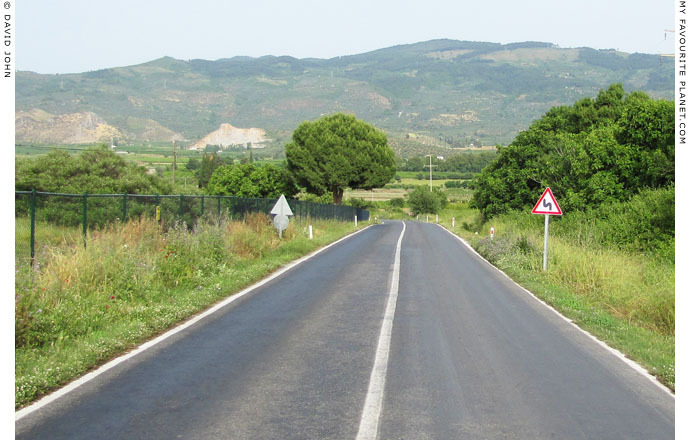 Roads in Turkey range from the most modern motorways to potholed highways and country roads and unpaved tracks. As in other countries, most drivers are friendly and courteous while some are totally mad. Traffic can be chaotic in larger cities such as Izmir. There are several firms in Izmir, Selçuk and Kuşadası offering car and motorbike rental. It is currently beyond the scope of this guide to recommend particular companies. The best advice we can offer is to shop around and ask locals, other visitors and staff at your hotel. The Otoyols (expressways or motorways) and some large road bridges (such as the Bosphorus Bridge in Istanbul) charge expensive tolls. You can not pay these tolls by cash or credit card. The only way to pay the tolls is with a "HGS" electronic-chip sticker or a toll transponder (small plastic device), which you can buy at post offices and participating Shell fuel stations. HGS stands for Hızlı Geçiş Sistemi (Fast Transit System), an electronic toll-payment sytem designed to speed up traffic flow. You buy credit for your transponder or chip card, which is affixed to the windscreen, and the toll is deducted electronically as you pass a toll booth. If you hire a vehicle in Turkey it should already be fitted with a HGS transponder. You can not buy a HGS device on the internet. Any website offering to sell these devices is bogus. The HGS system may improve traffic flow, but it also reduces the number of staff required at toll points and increases the government's ability to track the movements of citizens and visitors. Often there are alternative, though slower, non-toll routes for those not in a hurry. The Website of the Republic of Turkey General Directorate of Highways www.kgm.gov.tr publishes information in Turkish and English about the country's road sytem, as well as downloadable road maps. 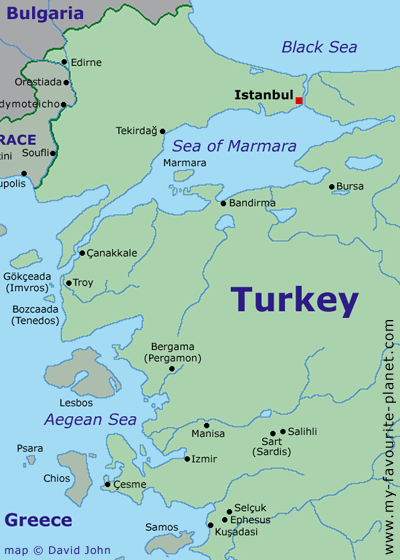 Map of north-western Turkey and the Aegean area. See a larger interactive map of this area.